Are you involved in a basketball team, volleyball team or other sport with a lot of other taller than average people? Then the Port Authority Tall Pique Knit Polo shirt could be just what you need. This stylish polo shirt comes in a variety of colors, is designed to fit comfortable and portray a confident, professional look to management, other teams and colleagues alike. If you want to get ahead of the game consider this fantastically versatile polo shirt and never look back. From school teams to company outings to golf tournaments, this polo will work for just about any occasion you can think of. Don’t let the pressure of an occasion put you off any more. You can always feel confident and sure of yourself and those surrounding you when you are not only dressed to impress but also dressed for success. The port Authority Tall Piquet Knit Polo shirt will lift you up to new heights. Fitted and tailored to suit the taller gentleman, this polo shirt will be a great addition to any wardrobe and don’t forget, you can have it customized with your teams logo, your organizations emblem or your school name to bring that extra touch of personality and class. The Tall Pique Knit Polo is the perfect fit for a team of basketballers as it is designed with taller people in mind. It’s all in the name “Tall”. The classic style is a great fit for pregame meetings, post match receptions and team occasions. These polo shirts are not only classy, but are also stylish, professional and make for a great smart-casual look in a professional setting. The Port Authority Tall Pique Knit Polo shirt weighs just 7 ounces and is made from 100% ring spun combed heavyweight pique, which is preshrunk. This construction makes it a wonderful choice for basketball, soccer and football teams alike, as it gives them a professional look, with the knitted feature especially making the shirt stand out. As there is a homely feeling to the texture of the polo you can put your mind at ease knowing you will be comfortable wherever you are going and whatever you are doing in this shirt. It’s also garment washed for extra softness, which gives a nice warm, comfortable feeling. The knit polo features a 3 button placket, which gives the wearer three different potential looks. You can wear a tie high for a smart look, button two buttons up for smart-casual or just leave the buttons open for a more laid- back, casual outlook. The horn-tone buttons match nicely with the classic knit feature, a must for any traditional polo. The locker patch is also a traditional inclusion and there are side vents to keep you cool in the warmer climates or in heated indoor facilities. 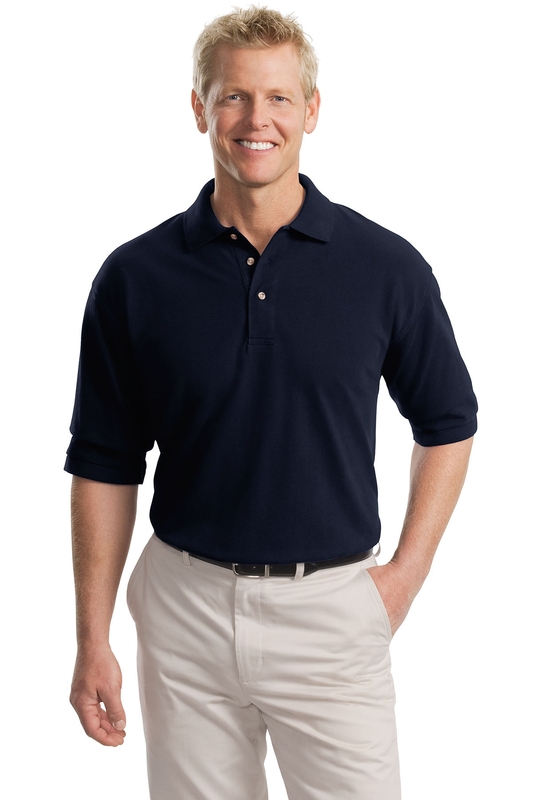 This polo comes in a variety of colours, including: Athletic Gold, Bark, Black, Blueberry, Burgundy, Classic Navy, Dark Green, Faded Blue, Faded Olive, Forest Ivory, Khaki-Heather, Light Blue, Light Pink, Navy, Orange, Oxford, Pistachio, Purple, red, Royal, Seafoam, Steel Grey, Stone, Sunset Red, Turquoise, White and Yellow. Sizes range from LT -4XLT, accommodating all body sizes and types.